Not all stress is the same. Some of the stress that we face in life can be more detrimental to our well-being, and some types of stress can actually be healthy for us. For example, chronic stress—the type of stress that seems to be constant and psychologically or emotionally draining—is the most harmful to our health and wellbeing. This kind of chronic stress can trigger the stress response and keep it triggered for long periods of time, leaving us exhausted and close to burnout. Eustress, on the other hand, can be beneficial and is actually necessary for our overall wellbeing. This is the type of "positive" stress that keeps us vital and excited about life. 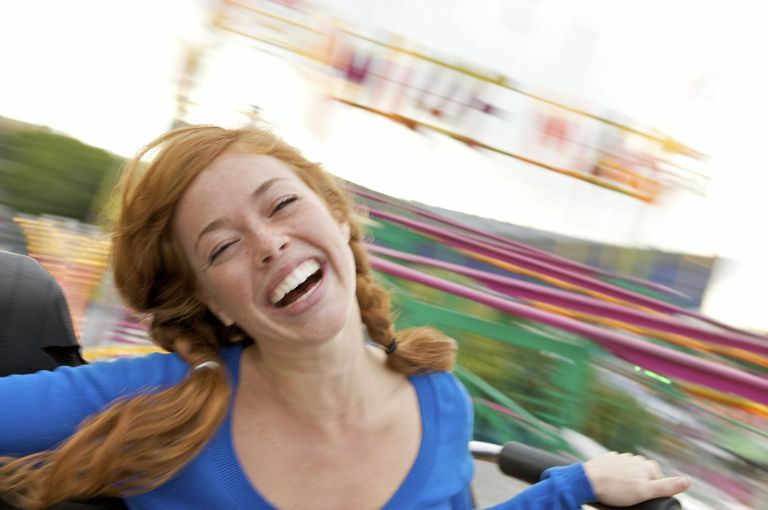 The excitement of a roller-coaster ride, a scary movie, or a fun challenge are all examples of eustress. The anticipation of a first date, the first day at a new job, or other exciting firsts also fall under the umbrella of eustress. Eustress is a type of stress that is actually important for us to have in our lives. Without it, we would become bored at best and, in more serious cases, depressed. We would begin to feel a lack of motivation to accomplish goals and a lack of meaning in life without enough eustress. Not striving for goals, not overcoming challenges, not having a reason to wake up in the morning would be damaging to us, so eustress is considered 'good' stress. It keeps us healthy and happy. Understanding eustress can help us to more easily manage other types of stress as well. For example, research shows that when an event is perceived as a "threat," we respond to it differently than if it's seen as a "challenge." Threats tend to elicit a greater stress response from us and create greater levels of anxiety. Challenges, on the other hand, can be exciting, and even enjoyable to overcome. Threats are scary, while challenges are opportunities to prove ourselves and learn how much we're capable of accomplishing when we really try. This understanding reminds us that we can view many of the stressors in our lives as challenges rather than threats merely by changing how we talk to ourselves about the challenges and by focusing on the resources we have to handle these challenges rather than focusing on what may go wrong and how damaging that would be. When we work on shifting our focus and approaching stress as a challenge whenever possible, we can manage these challenges more easily and have more vital energy to handle these stressors, without a feeling of being overwhelmed or unhappy. Trying to approach various stressors in life as we'd approach eustress enables us to manage that stress more easily. That said, while eustress doesn't generally carry the same type of damage as chronic stress, too much eustress can still tax your system. Just as a schedule can become overloaded and stressful even if the events are all "fun" activities, you can feel overloaded and stressed by too much eustress if you're not allowing yourself to return to a relaxed state and have a healthy balance of restorative downtime. Hence why it's balance is essential. A balance between work activities and fun activities is important, but a balance of eustress and leisure is also an important focus. Changing one's perspective can certainly help with stress management, but it's not the only strategy that should be used. If you have too many challenges in your life, even eustress can become chronic stress and lead to burnout or worse. It's important to be mindful of where your limitations are and to work to maintain balance in your life. This can mean cutting out any unnecessary obligations (particularly ones that you don't enjoy), adopting some resilience-promoting habits that can help you to be less reactive to stress overall, and become comfortable with saying no to new activities if they won't truly serve you. This takes practice but it can make all the difference in your stress levels. Glei DA, Goldman N, Chuang YL, Weinstein M. Do chronic stressors lead to physiological dysregulation? Testing the theory of allostatic load. Psychosomatic Medicine November 2007. Li G, He H. Hormesis, allostatic buffering capacity and physiological mechanism of physical activity: a new theoretic framework. Medical Hypotheses, May 2009.